I know you want me to talk about vampires, so I will..kind of; but the truth is, they're definitely not the only cool thing about Transylvania. We got the chance to check out a few of the most adorable towns in the heart of Romania and if you're considering a Transilvania adventure, make sure not to leave these out! This is the story of a guy much scarier than the Dracula you might know: Vlad III AKA "The Impaler". In 1431, Vlad's dad (Vlad II) was inducted into a knightly order, the Order of the Dragon (the original Targaryens?!). This designation earned Vlad II a new surname: Dracul, which then was passed down to his son. Having dragon as your name is pretty badass, but "drac" can also mean devil.. and this guy really lived up to his name. The Order of the Dragon was devoted to the defeat of the Turkish, or Ottoman Empire. When he was a kid, Vlad III was captured and raised by the Ottomans, but after his father and half-brother were killed by them, he wanted his revenge. After some tough years winning and losing his father's seat, he obviously was a bit pissed off. So much so, that when he finally got his throne back, he invited boyars to banquets, knowing they would challenge his authority, and then had them stabbed and impaled on spikes. Funny thing is, he is still seen as a ruler that was "harsh but just" and generally a positive character in Romania. We rented a car with our beautiful new Romanian friend Andra, and drove out to Sibiu! We decided to go far fist and work our way back to Bucharest through Brasov and Sinaia. First off, the drive through the Romanian countryside is absolutely breathtaking. Surrounded by gorgeous mountains and quaint streams, we could see why some people choose Transylvania for their off-the-grid getaways. Upon arriving in Sibiu, (deemed 2007's European Capital of Culture) the first thing we noticed is how drastically different the architecture is from Bucharest's. Ignoring the hilarious fact the houses look like they have eyes, the impeccably preserved Medieval walls and Germanic architecture combine to send us off to a time long long ago; say about 900 years ago (!!!). The Saxon and Hungarian influence is not only seen in the architecture; many of the folks living here actually are German or Hungarian, some of the signage is also written in these languages, and of course–the food! No wonder this charming town used to be the capital of Transilvania. This is what a pit stop looks like in Romania. 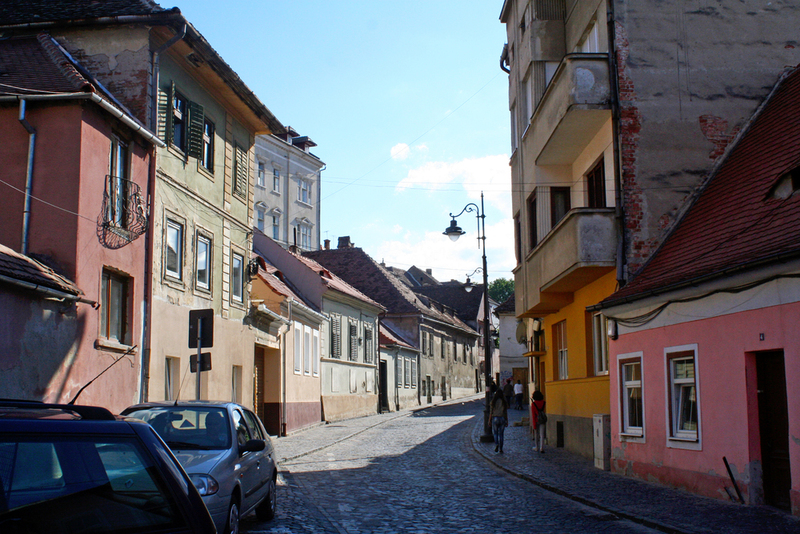 The adorable lower town of Sibiu is lined with colorful houses along windy streets. ..another clock tower.. but look at those tiles! Look! It's the BRIDGE OF LIES! Another adorable town in the heart of Romania is of course, Brasov. This one is quite a bit more well-known to the tourist population, probably due to it's ideal location. It's the perfect mid-point between Bucharest, some of the main ski slopes, and some of the most visited castles (Dracula's castle is only 45 min away in Bran). Like SIbiu, it's also characterised by it's quaint, medieval charm and Saxon influence. Delliiiicious traditional Romanian dessert. Cinnamon plum dumplings. If you're an outdoorsy type, you might want to consider Sinaia. It's breathtaking views of the Carpathian mountains make it a perfect escape from the hustle and bustle in Bucharest. In the winter, it's a less crowded and less expensive alternative to the Alps (the Carpathian mountains are even called Tansilvania's Alps! ), and in the summer, it's a perfect place to go for a hike. It's beauty even made it the summer getaway choice of the Romanian Royal family. For more vampire fun... watch this.